This article is republished from The Conversation under a Creative Commons license. It was first published in July 2017. Read the original article. Abandoned industrial buildings at San Francisco’s Pier 70, with a smokestack in the background. San Francisco has embarked on a project to transform its industrial southeast waterfront into a bike-friendly destination called the Blue Greenway. When completed, the Blue Greenway will be a 13-mile network of parks, bike lanes and trails along the southeastern edge of the city. Among its many benefits, the project creates green space and waterfront access in the low-income Bayview Hunters Point neighborhood. The Blue Greenway is part of a larger transformation of Bayview Hunters Point. This older, neglected neighborhood is still full of vacant lots and a large, abandoned naval base, but it is becoming a landscape of hip townhomes and new coffee shops. Its transformation includes the complicated cleanup of many toxic waste sites – most notoriously, a military radiation lab on the former Hunters Point Naval Shipyard. The Blue Greenway project cleans up toxic land along its route with funding from the Environmental Protection Agency’s Brownfields Program, which supports the cleanup and reuse of contaminated sites. Brownfield redevelopment projects like the Blue Greenway are intended to bring environmental and economic benefits to run-down urban areas. And yet, as I have found in my own research, they can also contribute to gentrification and economic displacement. 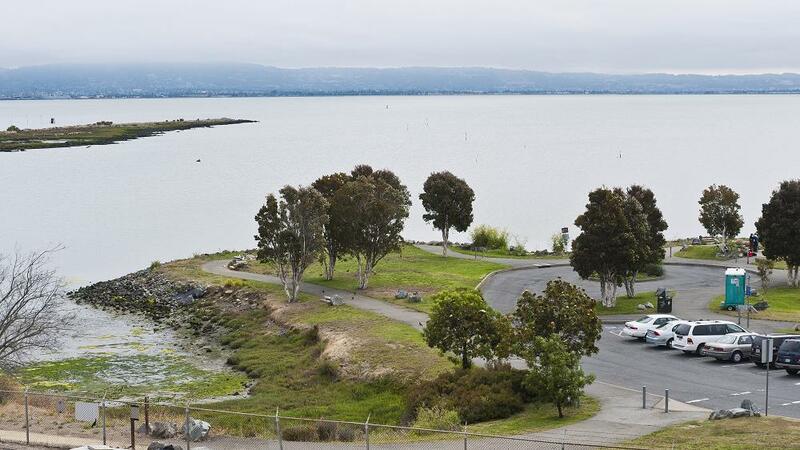 The Blue Greenway creates small parks and waterfront access along San Francisco’s industrial shoreline. Brownfields are contaminated sites such as old gas stations, dry cleaning facilities, former factories and power plants. In the case of the Blue Greenway, they are small, vacant lots in old industrial areas and median strips along the road. Brownfields are less heavily contaminated than sites on the EPA’s Superfund list, which can take decades to clean up. The brownfields program is designed to move more quickly and make contaminated sites available for reuse. Ideally, returning these sites to use stimulates the economy and revitalizes neighborhoods. The program is widely popular with people who live near brownfield sites, as well as with city politicians and the private sector, which profits from the business of cleanup and redevelopment. EPA’s brownfield program was developed in the mid-1990s to provide incentives for states and companies to voluntarily clean up toxic spills and vacant industrial sites. At that point, Superfund was the only federal program that managed toxic cleanups. Superfund cleanups are federally mandated, top-down projects in which EPA has significant enforcement authority – notably, to make polluters pay for the cleanup. The Massachusetts Museum of Contemporary Art in North Adams is housed in a former electronics manufacturing complex that was cleaned up with funds including federal and state brownfield remediation grants. The museum has become a major tourist draw that attracts thousands of visitors yearly. In contrast, the brownfields program is more market-friendly. It decentralizes authority to states and offers incentives for voluntary cleanups, such as grants, tax breaks and other subsidies. The brownfields program emerged at a moment when many U.S. cities sought to redevelop their postindustrial areas. In contrast to Superfund, which at that time had little to say about land reuse, brownfields projects aimed not just to clean up industrial sites but to redevelop and reuse them. The word “brownfield” itself is a real estate term: Brownfields are the opposite of “greenfields,” or undeveloped land. However, these projects also raise questions about environmental justice. Many brownfield sites are concentrated in low-income communities of color. This spatial concentration of toxic sites is, in part, an effect of redlining – the practice of denying loans to racial minorities based on color-coded neighborhood maps of financial risk. It is also an effect of 20th-century patterns of inner-city disinvestment and discriminatory zoning policies, which allowed for the siting of hazardous industries in low-income neighborhoods. Together, these and other factors have produced well-documented geographical entanglements of race and toxic waste. At its best, brownfield redevelopment can transform vacant lots into parks and bring other amenities to neglected neighborhoods. It is most successful when local communities are meaningfully involved in the planning process, and when it is combined with other policies aimed to reduce social and economic inequalities. One successful example is Fruitvale Transit Village in East Oakland, California, where a nonprofit called The Unity Council led the transformation of an old rail parking lot into a mixed-use development. The complex includes a senior center, a library, a health clinic and a mix of market-rate and affordable housing. Fruitvale Transit Village in Oakland, California was designed by the city, planners, neighborhood activists and developers to bring a mix of housing, services, retail and transit together near the Fruitvale BART station. But these projects can also contribute to green gentrification by increasing land values and rents and displacing low-income residents. One example is New York City’s High Line, an old elevated rail line that was “recycled” into a destination by converting it into a walkable pathway, lined by native plants. Today the High Line is an enormously popular attraction. It also has spurred development that has priced many small businesses and less wealthy households out of the neighborhood. Ideally, EPA’s Office of Environmental Justice could help to address some of the inequalities produced by brownfields cleanups. However, President Trump’s proposed 2018 budget for the EPA eliminates this office. It also cuts funding for the brownfield program, by 30 percent, from $48 million to $33 million, along with large cuts to Superfund cleanups and emergency response capabilities and other hazardous waste management programs. These cutbacks threaten the lives and livelihoods of all U.S. residents, and are unpopular among both Democrats and Republicans. Yet because of the legacies of race and industrial zoning patterns, their effects will fall hardest on already marginalized communities. One way to protect communities from both toxic waste and green gentrification would be to increase funding for EPA’s Brownfield Job Training Program, assuming that it survives the Trump administration. Many brownfield communities struggle with unemployment, and residents are easily priced out of neighborhoods as they become more expensive to live in. The Brownfield Job Training Program creates jobs for low-income residents, which can help them reap some of the benefits of brownfield redevelopment. State support for affordable housing and community land trusts also can complement brownfield cleanups. Successful community land trusts are managed by nonprofits that buy land and build affordable homes. The homes are sold to local residents, while the nonprofit retains ownership of the land. This strategy can protect low-income neighborhoods from commercial developers. More broadly, our notions of “sustainability” and “urban greening” ought to include values of justice and equity. Otherwise, important projects like the Blue Greenway will build sustainable waterfronts for the urban elite, rather than spreading the environmental benefits of toxic cleanup to the many.